Contact lenses are a viable and popular option among those with poor vision. Today’s contact lenses come in a vast array of options concerning prescription, fit, and material, and can be tailored to the needs of the individual to provide a wonderful experience for the wearer. In addition to eyeglasses, All Eye Care Doctors provides eye exams for prescription contact lenses in Medford, MA, and other nearby communities. Though similar to our thorough comprehensive exams, eye exams for contact lenses involve some unique processes that you may not yet be familiar with. 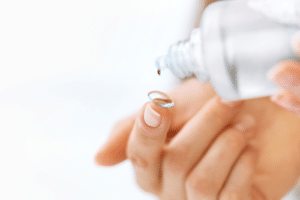 Continue reading to learn about what you will experience during a routine contact lens exam. There are continuous innovations in contact lens technology coming out, and indeed, the advances that have come out in just the past few years have been quite astounding. When you come in for your exam at one our vision centers in Porter Square in Cambridge or Station Landing in Medford, your Optometrist will check your general eye health conditions and ask you questions about your lifestyle, contacts you have been wearing, and general health to assess which kinds of contacts would most likely suit you best considering the latest technologies available. Your eye doctor will recommend depending on your eye health and lifestyle monthly, bi-weekly, or daily disposables, as well as soft versus rigid gas permeable (GP) lenses. If you have more particular eye conditions, such as dry eye syndrome or astigmatism, your doctor will also be able to recommend the types and brands that will work for you best. If you are interested in same day contacts near Cambridge, MA or Medford, MA call All Eye Care Doctors today. Not all eyes are alike, and your doctor will need to take some measurements and assess the condition of your eyes to ensure that your contacts fit comfortably. Your optometrist will need to assess your corneal curvature, the size or your iris and pupil, and will need to test you for various eye conditions including dry eyes, Keratoconus, lesions, and other conditions to tailor your contacts prescription to your needs. Towards the end of your exam, your doctor will most likely order a pair of contacts to wear for a trial period to see if they are the right fit for you. If so, they will then make an order for your prescription, leaving you free to enjoy your new contact lenses. Are you interested in getting fitted for contact lenses? All Eye Care Doctors are the best in the business. If you would like to schedule a contact lens eye exam with our team of professionals, call our Cambridge office today at 857-600-0701 or our Medford office at 781-393-5367.